I'm going to start a series about life (and culture) here in Spain. Obviously, there are many things that are different than the states and I want to share them with you -- give you a better understanding of our new country and our new way of life. 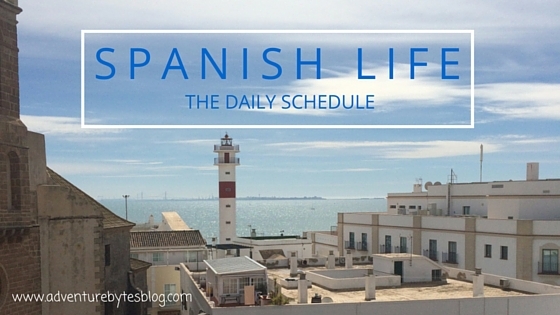 Let's start first with the Spanish schedule because besides the language, the biggest difference that most people visiting Spain will notice is the daily schedule. This can also be the hardest thing for people to get used to (not just those from the states, but from other countries as well as this schedule is unique to Spain). 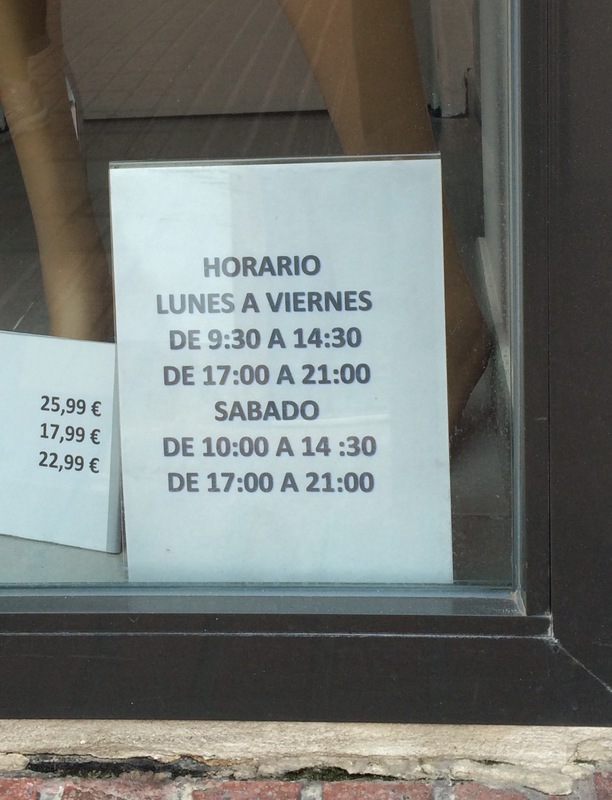 Most things in Spain run on a later schedule. * Breakfast is often around 10-11am. Those at work will often take a break for coffee at this time (and maybe some food too). Lunch is the big meal of the day and at roughly 2pm. Most business, schools, practically everything is closed for lunch (or what Americans call the siesta -- but no, people aren't really going home and napping -- they are enjoying a large family meal). The only thing open from roughly 2-5pm are restaurants and larger stores (think big grocery stores, chain stores, malls). Then everything else opens again around 5pm. Those who don't head back to work are out walking, going to parks and/or enjoying the nice weather (this is called the afternoon paseo). Dinner is not until 9-10pm and is much lighter (tapas). People -- this includes the whole family (babies and kids too) -- are often out until much past 10pm and go to bed very late (hence why things don't open until later in the day). Everything is closed on Sundays. Some restaurants are open, but everything else is closed (grocery stores, malls, big and small shops). So how does this work? Well, it takes some getting used to, that's for sure, but it's easily manageable. It does take a lot of planning to get my shopping done -- between naps and meals for Serafina and also the crazy store hours, it can get a little difficult. If I need anything from a smaller store or if I plan to go shopping locally, it is best to go first thing in the morning (meaning 9-10am). If I need to go grocery shopping or to a larger store (like IKEA), it is best to go during lunch time because NO ONE is there! For example, we went to IKEA last week during lunch and we were pretty much the only people there -- it was great! But even sometimes my planning fails me... I have been meaning to get to a baby store for WEEKS (literally since March) but every single time I can actually go -- it's closed because its lunch time and by the time the store opens again, Trevor is home, we are eating dinner and it's off to bed. One day, I will get there.... I keep telling myself mañana (which is very Spanish of me)! And what if we want to go out to dinner? Well, this is where it is most challenging. Most Spanish places don't open until 8pm for dinner (the restaurants will close between lunch and dinner). Going out to eat was very easy when Serafina was extremely jet lagged and not going to bed until midnight each night. We were on a Spanish schedule the first two weeks we were here! However, Serafina has since worked her way back to a more American schedule, so going out to dinner is tough. Because we enjoy going out to eat and experiencing the culture, we will go out to eat on the weekends -- enjoying the later Spanish breakfast or the longer afternoon lunches. And luckily for us, Rota is a very American friendly town, so we have found various places that are open earlier for dinner (meaning a more typical American dinner hour) but that doesn't necessarily serve American food -- we have been able to find places that serve tapas and Spanish style food at earlier dinner hours. The only downside to this is that we are often the only ones at the restaurant or the other people there are Americans! Overall, we still keep an American schedule -- this is mainly because Trevor works an American schedule and Serafina put herself back on a schedule similar to when we were in the states. She is going to bed a little later, but also waking up later so it works for us. So there you have the Spanish daily schedule and how we are slowly adapting and making it a part of our daily schedule as well. Let me know if you have any questions! *The history behind the day to day life in Spain is pretty interesting (or at least the history major in me finds it interesting). A quick overview -- the "siesta" came about because Spain used to be a predominately agricultural country and the workers would take their lunch late to avoid being in the sun during the hottest part of the day. They would work in the morning, take a long lunch to avoid the heat and return in the evening when it was cool again and this just continued even as the country moved away from farming. Also, when daylight savings time started during World War II, Spain decided to be on the same time zone as the majority of Europe (CET - Central European Time) to show their support to Germany. However, Spain is on the same longitude line as the United Kingdom, meaning Spain should really be on GMT - Greenwich Mean Time. This means that the sun sets extremely late and rises very late (when we arrived in February, the sun was not coming up about 8:30 each morning). The sunset and sunrise also encourage the late start/late evening lifestyle. Great history lesson! I always learn something when i read your blog! Ha. But really that is very interesting about the time zone. Thanks! It'll be interesting to see what happens in the next few years -- there is talk that Spain will switch time zones or stop daylight savings.